NerdKits was recently a sponsor of MIT's Battle of the Bands 2009, a fundraising event which supports the Children's Miracle Network, and also is a popular gathering during MIT's Campus Preview Weekend for incoming students. To show off our microcontroller kits during the event, we built a sound meter which uses the piezoelectric buzzer (included with our USB NerdKit microcontroller kit) in reverse, as a microphone. 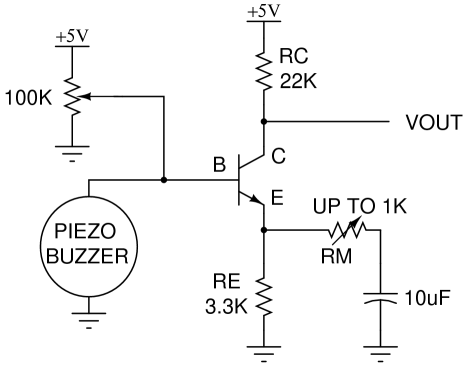 This provides an opportunity to demonstrate a single transistor amplifier, to make the signals from the piezoelectric element big enough for the microcontroller's analog-to-digital converter (ADC) to read. Since our sound level meter had to be visible in a big room (the Lobdell food court in MIT's Student Center), we opted to use our bright red LED Marquee, which has 120 high-intensity red LEDs all controlled by the one ATmega168 microcontroller. We won't talk about how we built that LED array on this page -- it has its own video tutorial and related materials which you should reference for that part of the project. In the video tutorial, Humberto gives an extended description of the math behind how the amplifier works. This includes concepts such as a simple model for the NPN bipolar junction transistor (BJT), biasing, how to calculate gain, and adding more gain at higher frequenies with a technique called "bypassing". In the schematic above, the 100K potentiometer is adjusted until the transistor's collector current is approximately 100 microamps (10-4 amps). This is measured with a voltmeter across RE until the voltage is approximately 0.33 volts. Please watch the video for a full explanation of the transistor model and how we build up to this circuit. Following along with the assumptions made in the video, and ignoring RM and the 10uF capacitor, the gain of the amplifier is approximately 22K/3.3K = 6.7. But at higher frequencies, the 10uF capacitor looks like a short, and the gain of the amplifier is roughly 22K / (3.3K // RM). This last part in the denominator (RA//RB) means the parallel combination of two resistances, which equals (RA*RB)/(RA + RB). dVBE / dIC = 250 ohms. So if RE is much greater than Vth / IC (250 ohms in this case), then we get back to our original simplified gain equation that was derived in the video, dVOUT / dVB = - RC / RE. But now if, for example, RE = 0, then while the earlier gain equation would have suggested infinite gain (dividing by zero), our new one would suggest that it's really - 22K / (RE + 250), or a (negative) gain of about 88 for RM = 0. With RM = 1K, as in our actual potentiometer in our circuit, the (negative) gain is about 18. Having a potentiometer or just swapping out resistors lets you change the gain over a wide range. although note that the second one expects a lot of mathematical comfort. Also, if there's interest expressed from our NerdKits customers, we can certainly start making more analog-oriented video tutorials! 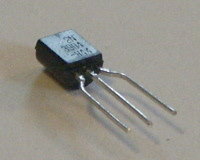 2N3904 NPN BJT 1 The 2N3904 is a commonly available NPN bipolar junction transistor, and certainly has the gain and frequency performanace for low-frequency applications like this one. (See manufacturer's datasheet.) 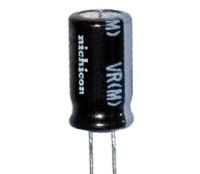 Other NPN transistors, like a 2N2222, will also work fine in this application, but note that substituting a MOSFET may not produce the results you expect. MOSFETs don't have the same exponential current-voltage relationship that bipolar transistors do, so the math can be quite a bit different. Resistors, one each of 1K, 3.3K, and 22K 3 total Several 1K resistors (brown-black-red) are included with our USB NerdKit, but the other two sizes, 3.3K (orange-orange-red) and 22K (red-red-orange) are needed as well. Also, instead of a 1K resistor, our configuration shows a 1K potentiometer, which lets us have a continuous gain adjustment, but this is optional and not needed. With just the 1K resistor, you can still demonstrate three gain settings: RM = infinite, RM = 1K, and RM = 0 (just a wire). 10uF capacitor 1 This 10uF electrolytic capacitor is needed to perform "bypassing" to get higher gain at high frequencies. Please note that this kind of capacitor is polarized, which means it can only tolerate a voltage across it in one direction. There is a lighter stripe down one side of the capacitor which is adjacent to one of the leads: this lead must connect to the lower voltage, which in this circuit is ground. 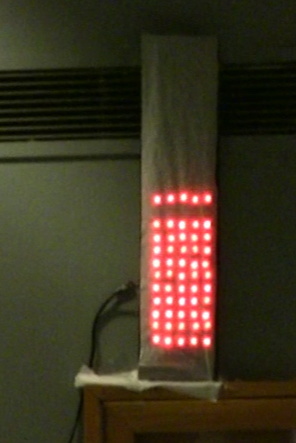 For the LED array version as shown in the video, the LEDs and overall array setup from the LED Marquee project are also needed. 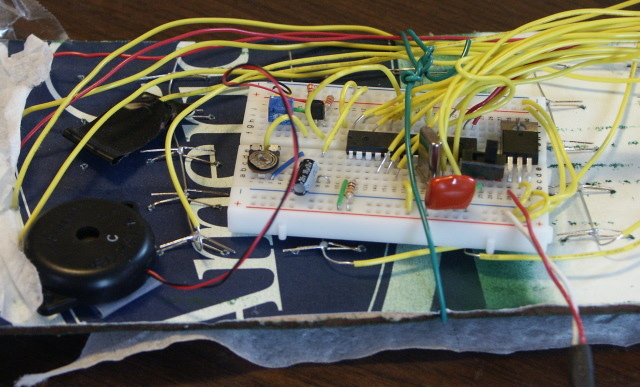 A multimeter is highly recommended for building and debugging this project. We have two different models available in our store. One of the pins was required to for the ADC, so we had to use two less columns of the LED Array. Since the sound meter does not need to take text from the computer, all those parts of the code have been removed, and the scrolling code was made much simpler. font.txt was modified to make the font be "sideways." This was done because the Marquee was rotated 90 degrees so that bars would go up as noise level went up. Since we do not expect everybody to try to make an LED Marquee, we also made a version of this code that works with just the LCD. 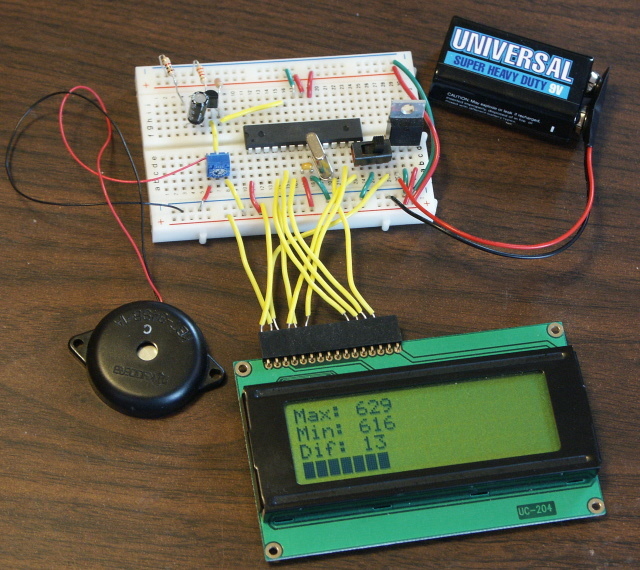 This code measures volume the same way, and has the same amplifier described above, but instead it just prints the information to the LCD, and represents the volume bars using black characters on one row of the LCD. For the LED array version, you can download the source code here. 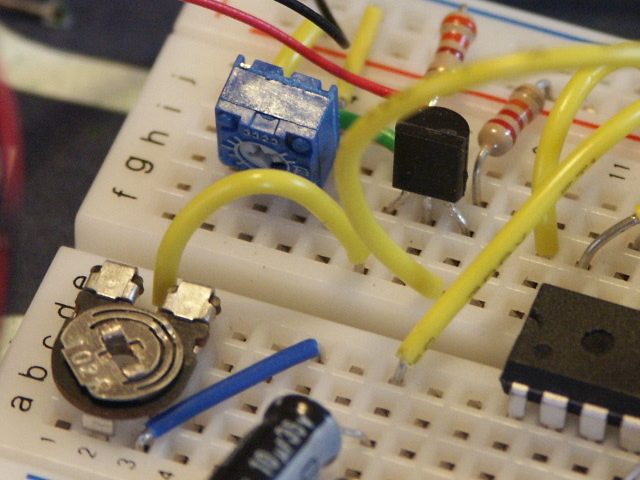 Start with a standard NerdKits microcontroller project and Makefile (included with the kit) and plug in this source code. For the LCD version, you can download the source code here. Start with the standard NerdKits microcontroller project and Makefile (included with the kit) and plug in this source code.